Here you can generate free for personal or commercial purposes your QR-Codes. Your data / settings are not stored and it will not be charged. The generated QR-Codes are fully available for you. Please select the paper icon. You can enter up to 300 characters. The fewer characters the better for the code to be readable. Generate QR-Code. Select if for Web applications, the PNG file or JPEG file and for printing choose SVG file or EPS file. Please select the address book icon. Fill out the fields and click Generate QR-Code. Select if for Web applications, the PNG file or JPEG file and for printing choose SVG file or EPS file. Please select the calendar icon. Fill out the fields and click Generate QR-Code. Select if for Web applications, the PNG file or JPEG file and for printing choose SVG file or EPS file. In the QR-Database it is possible to generate QR-Code for any number of products with its data or website url. This is good options to manage the QR-Codes of products in single interface. For example if you are managing a web shop then for each product you can generate a QR-Code and use it for marketing. The possibilities can be endless. The QR-Database can additionally support in generating as well managing many other codes such as EAN-codes, BAR Code for example. Select for example, EPS format for vector graphics. Insert the code freely scalable in Illustrator, InDesign or QuarkXPress, and use this in any size for business cards, flyers, car advertising or storefront. Also for magazines or catalogs, the QR-Code allows you to browse through to product pages quickly and easily. How do I use the QR-Code in the company, for customers or suppliers? 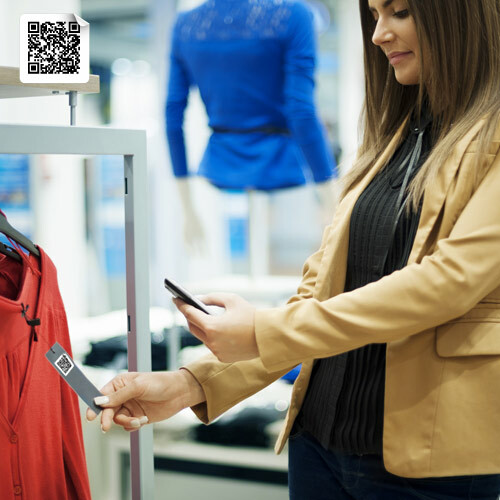 Automate you many processes with the QR Code creations starting with some few basic processes to infinite process later on. That is the job of the QR-Code Database and in this area we are happy to assist you! Of course, we take into consideration your existing software structures too. Our QR-Code comes with no watermark, you can easily place your logo in the middle of the code and use it. Only thing you should care is logo should not cover the code, see that the code is visible (about 60%). Also take advantage of our Free service before others for generating as many QR-Codes as you need for Websites and texts and other. For free you can generate only up to 300 characters, you do not want to loose this opportunity for logo. The QR-Code (Quick Response Code) is a two dimensional code, developed by the Japanese company Denso Wave in 1994. The QR-Code is a square b/w pattern representing the encoded data. The marks in the corners are there for orientation. You have questions about QR code database or individual QR codes with logo? For example, the widespread usage of QR- Codes with in the company. We are happy to help and advise you in the respective areas. Please save this QR code on your hard drive and import them into the respective graphics program via the normal import method of the program. We recommend you to always use the vector version EPS-File for professional Printing. The variants PNG and JPEG can of-course be used in all areas, but they loose quality if you zoom or increase their size. We guarantee that all our knowledge to your requirements is available. In case of difficult requirements, our special customer centric customizations and individual solutions come to fruition. We analyze your needs and provide appropriate solutions. We help to optimize your business. We train you and your team in all areas of information technology.